When Father Kopp and a number of Westphalian families left Detroit in September of 1837 to found their own village (an American Westphalia) in Clinton County, Father Clemens Hammer was appointed pastor of Detroit’s Germans. By 1838, Michigan’s population had reached 170,000, of which between 20,000 and 24,000 were Catholics. Of these, 3,000 were converted Indians, 8,000 were English, Irish, German, and American, and the rest were French. About thirty priests tended this multi-lingual flock. Between that time and the end of the century, such an influx of Catholics (especially German, Irish, and French) had swarmed to the United States, that anti-Catholicism flared. Even within the faith there were problems, because national groups were disappointed with pastors and prelates who did not speak their native tongues. This foment occurred mostly in dioceses other that Detroit, except for the well-publicized “Polish riots” at St. Albertus and a brief disagreement between Bishop Lefevere and the trustees of St. Anne’s Cathedral. Bishop Peter Paul Lefevere’s greatest obstacle was a dearth of priests to serve his burgeoning diocese and a lack of money for all the building that had to be done in this growing but poor area. The new cathedral of SS. Peter and Paul took so long to be built (four years) because he insisted it would be paid for as it was erected. He also abolished trusteeism so that control of diocesan money could be centrally managed. He issued an order that all church property must be in the name of the diocese, a recommendation that had been made by the Council of Bishops in Baltimore in 1829. When, in 1840, Father Kundig returned to Detroit to organized the Germans into a parish apart from the Irish, Bishop Lefevere gave him authority to solicit funds for the building of St. Mary’s Church. The initial fund-raising meeting netted the grand sum of $2.50. The plan began to come to fruition early in 1841 when Antoine and Monica Beaubien donated their property (for $1.00) at St. Antione and Croghan (now Monroe) to be used for the building of St. Mary’s Church for Detroit’s German Catholics. The cornerstone was blessed on the Feast of Corpus Christi, June 19, 1841, and a magnificent structure soon began to take shape. Its completion fell to Father Otto Skolla who took over the pastorate of the parish in May of 1842 when Father Kundig suffered a nervous breakdown. Father Skolla was a Franciscan who had been freed from his monastic obligations so he could become a missionary to the Indians. St. Mary’s was his first church assignment. Father Kundig, who had been named a regent of the University of Michigan in 1841, lived out his declining years in Milwaukee, where he died, in 1879, at the age of 74. Detroit’s Kundig Center, a haven for the aged, is named for him. On June 29, 1843, the first St. Mary’s Church (on the same site as the present one) was consecrated in honor of the Immaculate Conception of the Blessed Virgin Mary. 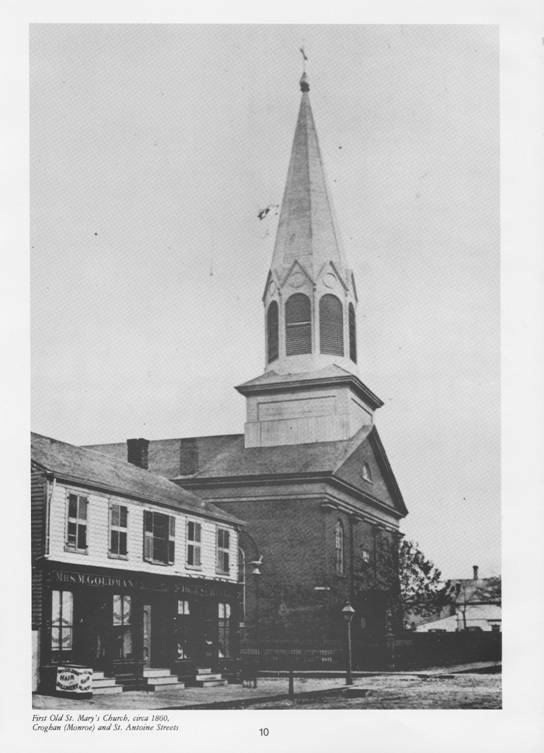 According to church archives, the solid brick structure had a steeple and cross that were “visible for a great distance.” That steeple contained four bells and the largest – named “the Ave Maria” – was donated by Antoine Beaubien and his wife. Its dimensions were 60 by 125 feet, and it was well proportioned, built of brick, and had a steeple surmounted by the cross. An interesting old document in the files of St. Mary’s Church reads: “In the year 1843, on the twenty-ninth day of June, I Peter Paul, Bishop of Zelanus, Co-adjutor administrator of Detroit, have consecrated this church in honor of the Immaculate Conception of the Blessed Virgin Mary, and I have sealed in its altar the relics of the Holy Martyrs, St. Felix and St. Emerita, and to every one of the faithful visiting the church, I grant one hundred days indulgence and to every one visiting it on the anniversary of its consecration, forty days, in the form usually granted by the church.” (signed) Peter Paul, Bishop of Zelanus, Co-adjutor administrator of Detroit.